I built this computer in January but just started the DIY project section of the site, so I'm posting it now. I've been using the same Dell E1505 laptop since I graduated college in 2005-06. It served me well and I still use it, but it was unable to keep up with CPU and RAM-intensive audio projects I was working on. I wanted to build a quiet and powerful PC as a Digital Audio Workstation with upgradability and expandability. 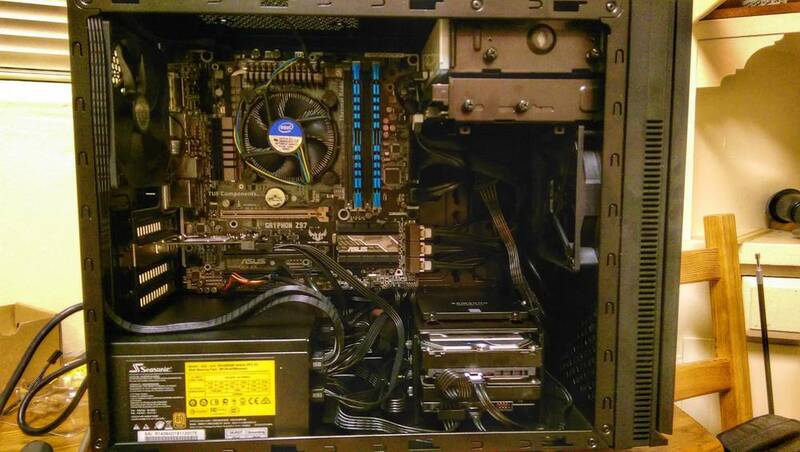 It was my first time building my own PC, so I spent several months preparing, researching and refining the build within my budget and parameters. Also a consideration was having the build be somewhat portable - to transport back and forth from the studio or location sessions. CPU: Most DAWs take advantage of hyperthreading, so I knew I was going to get an i7 chip. I liked the idea of having an unlocked multiplier, just in case I wanted to research and experiment with overclocking my CPU down the road. So I went with the i7-4790k. Motherboard: I went with the Asus GRYPHON Z97 for a few reasons. I wanted mATX to have access to generally smaller form factor cases. But more importantly, I wanted a motherboard with thunderbolt headers. A lot of pro audio manufacturers are moving to thunderbolt as the primary connection between their audio interfaces and the computer, like they did when firewire 400/800 was gaining traction. 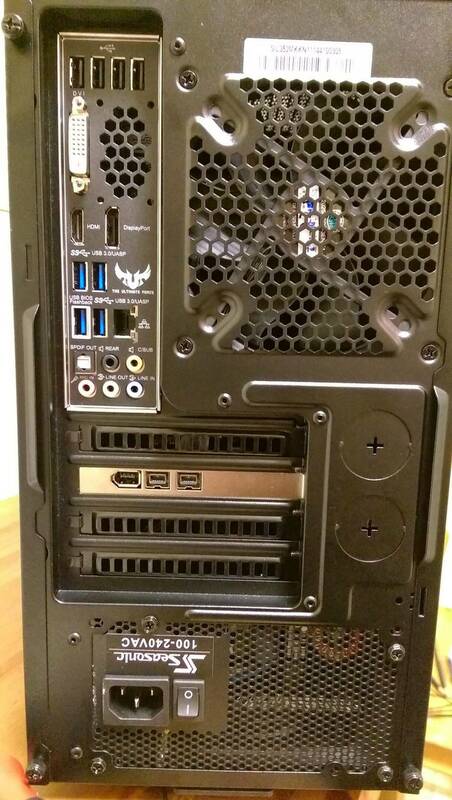 So I found the only mATX mobo with TB headers. It's a nice board and has plenty of i/o and features for my needs. Oh, and when did BIOS get so awesome, advanced and customizable? Testament to how long it's been since I've had a new computer. Memory: I wanted 16GB that was 1600Mhz or faster. The mobo supports 32 gigs so there's some room to upgrade. HDD: This drive will store all of the audio data that I work with on my recording/mixing projects. 7200RPM is important for this task. I also added 2 additional 7200RPM HDD's that I ripped out of external enclosures and installed into the case. These will contain media/personal files and my software instrument libraries. Case: I wanted something quiet, simple, not flashy. Originally I wanted really SFF but still mATX, so I was considering the Thermaltake Urban SD1, but ultimately went against it because it seemed like a dense nightmare. When it came down to buying time, it was between the Silencio 352 and the Fractal Design Mini. Went with the Silencio because it was cheaper and slightly smaller and also had an SD card slot. Video Card (or lack therof): I figured since I'm not a gamer (yet, maybe), I would hold off on a card for now and put it toward the mobo, RAM and CPU. Power Supply: Wanted a fully-modular power supply originally because I thought it necessary when I was considering the Thermaltake Urban SD1 case. The thought process remained after I chose against that case because cable management. I also wanted one powerful enough to add a GPU down the line. Windows 8.1: Was deciding between 7 and 8.1 and went with 8.1. It's different and will take some customization, but I do like some of the features and it's pretty quick. Firewire card: For my current FW400 audio interface. Most interfaces only reliably play nice with 1394 cards with the Texas Instruments chipset. I got this card because it has that chipset and was inexpensive. It's amazing what you can do if you just read the manuals. The build took about 4 hours and a 1/2 pack of cigarettes for me to complete (again, my first time). I had a lot of reasonable doubts and curiosities - is this the right direction? Oh I forgot that! Should this go in further? Which screws am I supposed to use here? Could I route these cables better? Am I properly grounded? Did I just break this? But all in all, I found the process to be really fun and satisfying. I primarily used my combined internet knowledge and the ASUS mobo manual, along with the other product manuals for specifics. Cable management could definitely be better, but I thought it was OK for my first time. The CPU power cable could/should have been routed underneath the mobo instead of how I have it routed to the back of the case, over the exhaust fan. But I had already gotten too far along for me to change that. The tray behind the mobo was pretty tight, so I spent some time messing with all of the SATA and power cables, trying to do a reasonable job. I'm not sure if all mobos are like this, but that little Q-Connector that you plug the indicator LEDs, reset button, etc and then onto the mobo is really handy. 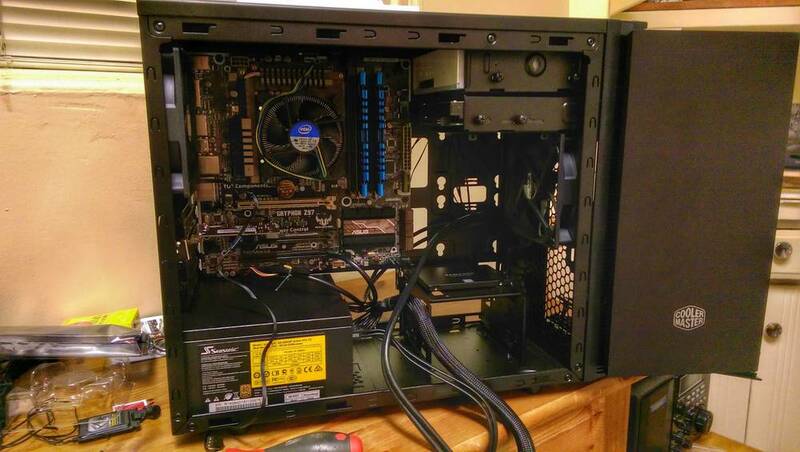 After I had assembled the entire rig to the best of my knowledge, I still didn't have the nerve to turn it on. So I waited until the next day and took it over to my buddy's computer shop for him to check out. He looked over my work and answered various questions I had and then together did a POST. All hardware (SSD, 3-HDDs, RAM, etc) reported for duty.